Demosthenes (384–322 BC, Greek: Δημοσθένης, Dēmosthénēs) was a well-known Greek statesman and orator from ancient Athens. His speeches show the height of classical Athenian skill at speaking. They also show us lots about the politics and culture of ancient Greece during the 4th century BC. Demosthenes learned rhetoric by studying the speeches of previous great orators. He delivered his first law court speeches when he was twenty. He argued effectively to gain from his guardians what was left of his inheritance. For a time, Demosthenes made his living as a professional speech-writer and a lawyer, writing speeches for use in private legal suits. At the age of 21, Demosthenes took the job of the commander of warships in Athens. 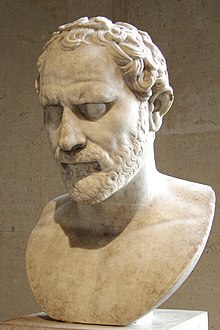 Demosthenes grew interested in politics during the time he wrote speeches for others. In 354 BC he gave his first public political speeches. He went on to devote his most productive years to opposing Macedon's expansion. He idealized his city and tried throughout his life to restore Athens' supremacy and motivate the rest of the Athenians against Philip II of Macedon. He sought to preserve his city's freedom and to establish an alliance against Macedon, in an unsuccessful attempt to impede Philip's plans to expand his influence southwards by conquering all the Greek states. After Philip's death, Demosthenes played a leading part in his city's uprising against the new King of Macedon, Alexander the Great. However, his efforts failed and the revolt was met with a harsh Macedonian reaction. To prevent a similar revolt against his own rule, Alexander's successor, Antipater, sent his men to track Demosthenes down. Demosthenes took his own life, in order to avoid being arrested by Archias, Antipater's confidant. The Alexandrian Canon compiled by Aristophanes of Byzantium and Aristarchus of Samothrace recognized Demosthenes as one of the ten greatest Attic orators and speech writers. According to Longinus, Demosthenes "perfected to the utmost the tone of lofty speech, living passions, copiousness, readiness, speed". Cicero acclaimed him as "the perfect orator" who lacked nothing, and Quintilian extolled him as "lex orandi" ("the standard of oratory") and that "inter omnes unus excellat" ("he stands alone among all the orators"). This page was last changed on 1 March 2018, at 05:02.